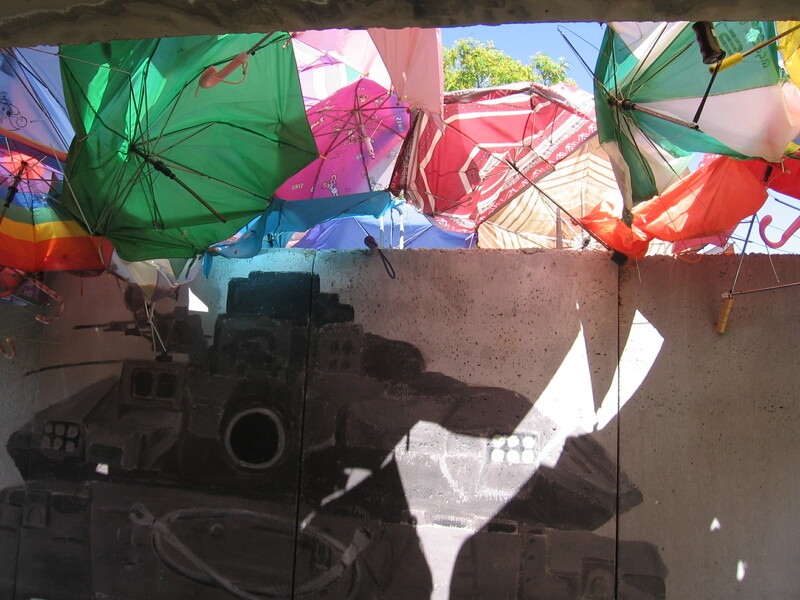 Pictured above is an art installation, the final art project of a student at Ma’ale Habsor Regional High School. I asked her if I could interview her about her work. Judih: Avital, hi. 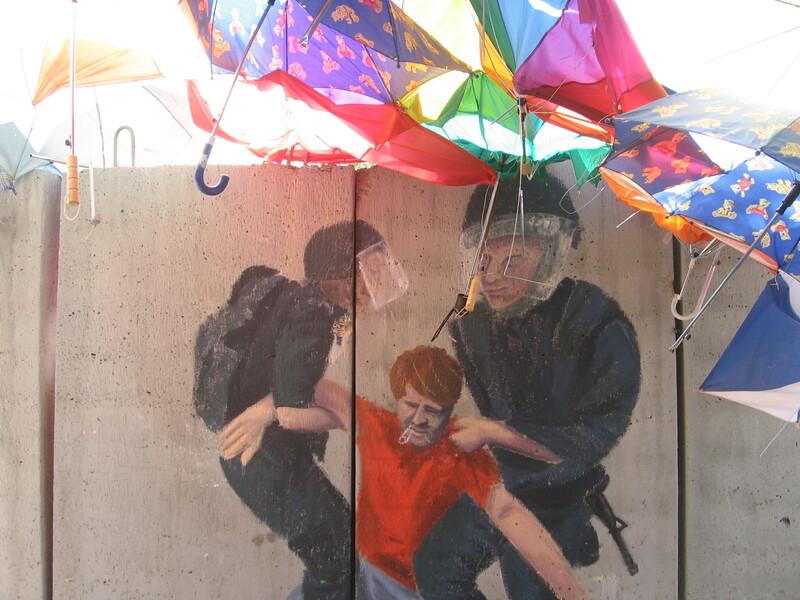 I’d like to interview you about your art project installed in Ma’ale Habsor High School. J: Where do you live? J: Tell me about your art project. How would you describe it? A: The physical description? Okay, to begin, the foundation is a kind of protective shelter, which has drawings on it. 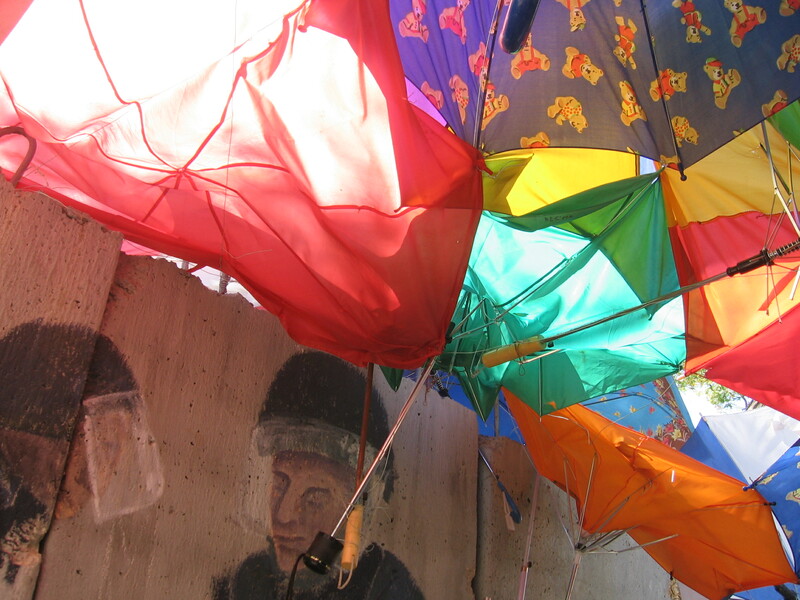 And on top are colourful umbrellas. J: How did you get the material to do it? A: The shelter was already there. And to get umbrellas, I put up notices on the bulletin board in Kibbutz Be’eri and in the Youth Clubhouse, asking for people to donate old, broken ones. I had a basket ready to collect whatever might come. I got most of the umbrellas from my kibbutz. Some I got from school and then I had to buy about five umbrellas, but only five! J: How did you get the idea? A: Okay, that’s the funniest part. I was in my art history lesson and it was mid-winter. And I saw my teacher’s umbrella in the corner of the room. I looked at it and rdecided I really wanted to do something with umbrellas. I started to brainstorm on paper about umbrellas: what they meant for me, their purpose and how they protect us from the rain. I jumped to the concept of protection against qassams and how the protective shelter and the umbrella were very similar in that they both help shield us. And then I thought about protecting the roof of the shelter (which is open to the sky). The idea of the falling umbrellas came as I started the actual work. J: When did you start creating it? J: How did you feel while you were making it? A: It was hard. Physically it was very hard to execute the idea . I had to get to the top of the shelter, holding the umbrellas, using a ladder that wasn’t high enough. And also it was difficult to connect the umbrellas. At the beginning I didn’t know how to go about doing it. Finally I joined them on the ground and lifted up the whole thing. That was the hardest part, I think. But friends from the art department helped me. The project is located right beside the Grade 9 classrooms and the kids were always asking me questions, some of which that I, myself, didn’t know how to answer. J: Can you think of any examples of questions they asked? and right at the beginning, one student asked me how I was going to do it. I couldn’t answer that, either! The kids were very sweet. Someone asked me why all the umbrellas weren’t red, and I said it was because they were similar to people, small, big, light, dark, decorated with pictures or plain, and if I had chosen all red ones, I would have lost that added meaning. The use of naïve colours, that was also important to me. That choice was part of my statement. J: How did you feel about the result, how it looked at the end? A: I was very satisfied. The responses of people made all the hard work worthwhile. It didn’t come out the way I imagined, it was more striking than I’d thought. J: How did other people react? A: I did the project before there was the Jerusalem demonstration of Otef Azza dwellers. They used red umbrellas to demonstrate their point, so after that, people asked me why I hadn’t done them red. But, as I’ve said, I chose my colours for a reason. And there were many other responses. That made me realize that the academic grade I might get for my work was not as important as people’s reactions. J: Can you remember any special reaction? A: An art graduate came to our exhibit and told me and one of the teachers that my work was the one she loved the most. J: Now, today, when you look at your project, after time has gone by and the colours have faded, what do you think? A: Actually, in general, I was supposed to have taken it down, but then I spoke with my art teacher, Gladys, and we decided that we’d leave it up until they tear down the school* (scheduled to happen this summer) because they don’t bother anyone. So meanwhile they’ll protect the shelter. J: And do you think the idea is any less relevant, today? A: It’s still relevant. The work is very political. For example, the problem with qassams reallly has no solution and my work continues to show that nothing has changed. There’s also added relevance in that there’s still no solution for Gilad Shalit. J: Avital, do you think expressing yourself through the art has helped you to deal with things? A: Maybe. During the time that I was working on it, there were many qassams. I think doing this work helped me deal with that. But this particular piece is not about dealing with things but rather expressing a political statement about our reality. J: Okay, thanks so much Avital. *Ma’ale Habsor Regional School is being torn down this year and re-built according to the safety regulations needed for Otef Azza. The school will be united with Habsor High School (which is for residents of the Moshavim in our area.) 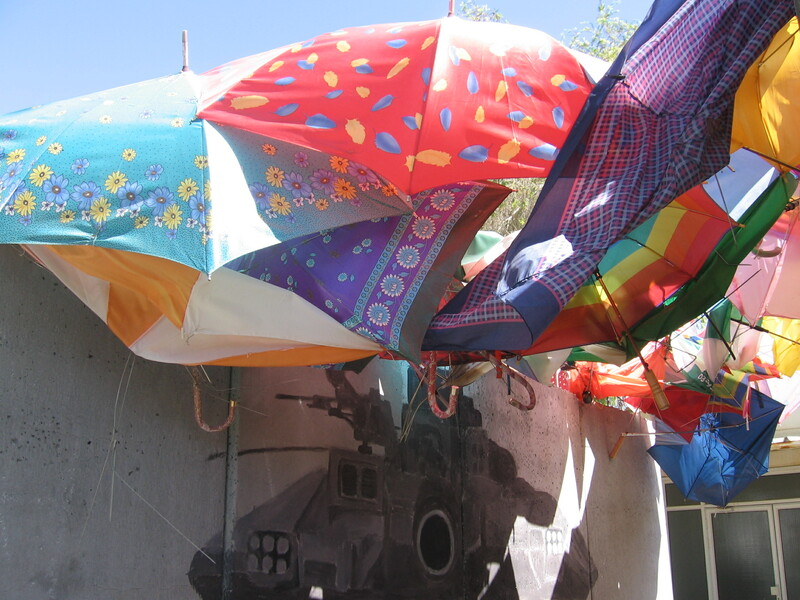 As a result, the art studio will be demolished along with Avital’s installation. 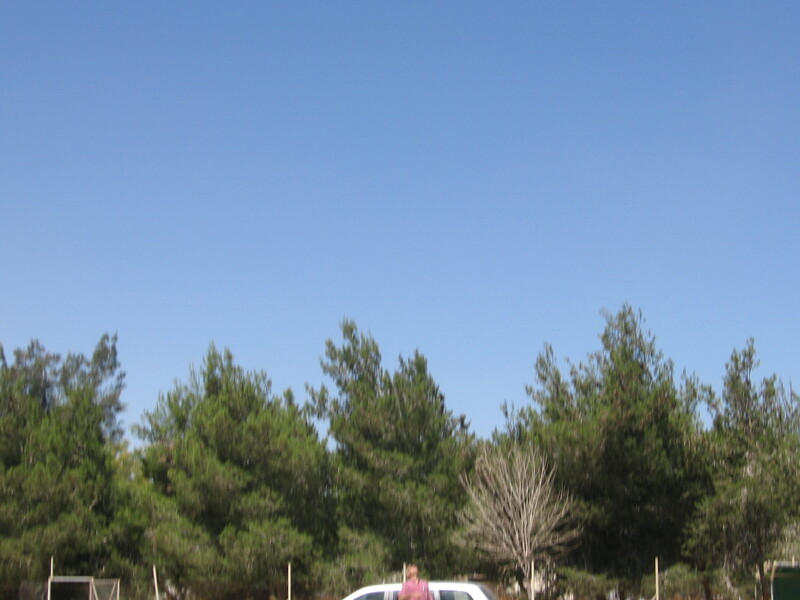 Avital lives in a kibbutz that has experienced a few direct hits of qassams. Her kibbutz, Be’eri, was the first of all the kibbutzim in the Ma’ale Habsor district that had qassams falling in residential areas last year and continuing this year, causing injuries, physical and certainly psychological. One such example can be found here. Avital, herself, is also one of the most sensitive students I’ve ever taught, who’s come to know herself as she’s matured. Her artwork is especially dramatic in light of her personality and environment. This particular piece of artwork has caused others to stop, look and experience something in a new way – a true measure of art, in my opinion. 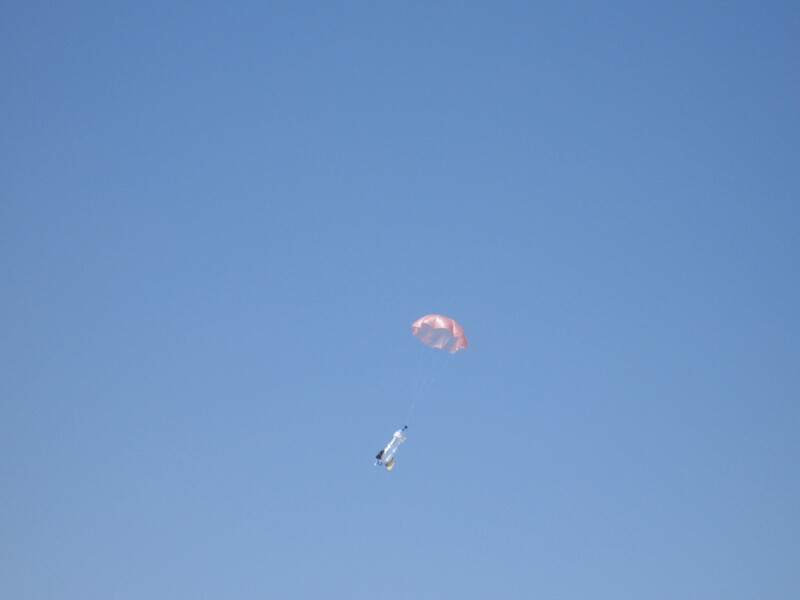 The photo is a shot of the plastic bottle rocket launched by Arieh Schkolnik about a month ago. It signifies the joy of quiet skies. May this feeling continue. Happy Shabbat weekend to all.